Richard Carmichael was born on April 11, 1913, in Hillsboro, Texas. He enlisted in the Texas National Guard on July 6, 1928, and was honorably discharged on July 5, 1932, in order to enter the U.S. Military Academy at West Point. Carmichael graduated with a commission as a 2d Lt of Field Artillery on June 12, 1932, and immediately began flight training in the Army Air Corps, receiving his pilot wings at Kelly Field, Texas, on October 1, 1937. His first assignment was as a pilot with the 18th and then the 6th Pursuit Squadrons at Schofield Barracks, Hawaii, from November 1937 to May 1939, followed by service as a recruit instructor at Hamilton Field, California, from May 1939 to March 1940. His next assignment was as a pilot and later executive officer and then commanding officer of the 9th Bomb Squadron, first at Hamilton Field, and later at Fort Douglas, Utah, from March 1940 to December 1941. Col Carmichael took command of the 88th Reconnaissance Squadron of the 7th Bomb Group in December 1941, and landed at Hickam Field, Hawaii, with his squadron of B-17 Flying Fortress bombers during the Japanese attack on December 7, 1941. He next served as commander of the 19th Bomb Group in Australia from February 1942 to January 1943, during which time he flew combat missions in the South Pacific Area. His next assignment was as executive assistant to Gen Hap Arnold in Washington, D.C., from January to June 1943, and then as commander of the 462nd Bomb Group at Smokey Hill Army Airfield, Kansas, from July 1943 to April 1944, and then deployed to India from April 1944 until he was shot down over Japan and taken as a Prisoner of War on August 20, 1944. Col Carmichael was repatriated on August 29, 1945, and was briefly hospitalized for his injuries in San Antonio, Texas, from August 1945 to February 1946. He served as an admin officer at Wright Field, Ohio, from March to August 1946, and then attended Air Command and Staff School at Maxwell Field, Alabama. After completing the course, he remained at Air University as Chief of the Air Power Employment Branch until June 1949. His next assignment was as commander of the 11th Bomb Group at Carswell AFB, Texas, from June 1949 to March 1950, followed by service as commander of the 98th Bomb Group, first at Spokane AFB, Texas, and then in Japan, from April 1950 to April 1951, during which time he flew combat missions during the Korean War. 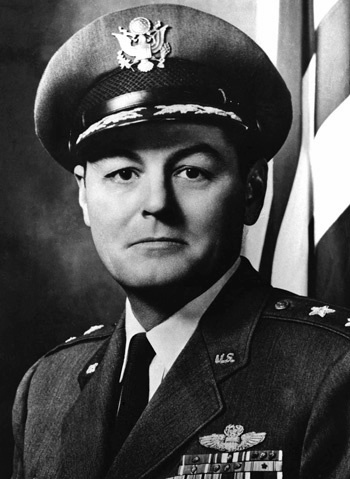 Gen Carmichael next served as commander of the 14th Air Division at Travis AFB, California, from April 1951 to May 1953, followed by service in Japan as commander of the Far East Air Forces Bomber Command from May 1953 to March 1954, which included bombing missions during the closing months of the Korean War. He served as commander of the 21st Air Division at Forbes AFB, Kansas, from March to April 1954, and then served as deputy director and then director of Personnel Procurement and Training at Headquarters U.S. Air Force in the Pentagon from April 1954 to July 1958. Gen Carmichael's final assignment was as commandant of the Air Command and Staff College with Air University at Maxwell AFB from July 1958 until he was medically retired from the Air Force on January 19, 1961. Richard Carmichael died on April 14, 1983, and was buried at Arlington National Cemetery. For extraordinary heroism in action against an enemy of the United States while participating in aerial flight on 20 August 1944. Colonel CARMICHAEL was Formation Commander of three B-29 aircraft on a precision daylight attack from a forward base in China against the coke ovens of the Imperial Iron and Steel Works at Yawata, Japan. Twenty minutes before the start of the bomb run, the formation was attacked by 35 to 50 enemy interceptors utilizing phosphorous aerial bombs and ramming tactics, and continuing throughout the bomb run. Disregarding fighters and the increasingly heavy and accurate anti-aircraft fire, Colonel CARMICHAEL kept his formation together and continued on the strike. In turning away, Colonel CARMICHAEL'S plane was hit by an aerial bomb in the middle wing section, putting the two starboard engines out of commission, setting several fires along the wings and injuring two crew members. The plane went into a steep, slow diving spin with Colonel CARMICHAEL fighting to regain control. He checked the descent long enough for seven crew members to parachute to safety. Colonel CARMICHAEL was determined to attempt to land the plane because of the two injured men who were unable to bail out, but at about 500 feet the entire right wing burned through and dropped off. He saw that he had done all that was humanly possible to save the lives of the two remaining men and, realizing the futility of remaining with his crippled bomber, parachuted to the ground. This mission, the first daylight strike against the home islands of Japan since the Tokyo raid of 1942, completely destroyed the vital enemy iron and steel works. It proved the real effectiveness of daylight precision bombing by B-29's. Colonel CARMICHAEL'S actions, in the face of the fighter and flak opposition and the hazards of mechanical failure on this mission of more than 3000 miles, reflect great credit on himself and are in keeping with the highest traditions of the Army Air Forces.